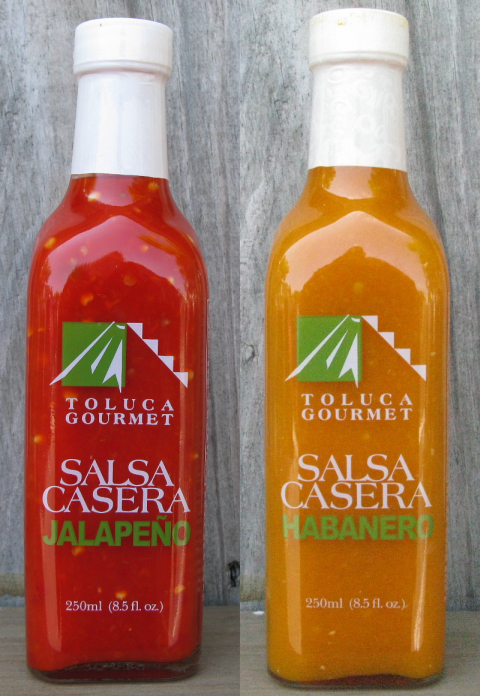 I recently received 2 beautiful bottles of salsas for review from Alex at Toluca Gourmet – a bright red Jalapeno sauce and a golden yellow Habanero sauce. As you can see from the pics, these sauces are packaged in a tall square bottle with labeling printed right on the glass. Very classy packaging. For more info, visit TolucaGourmet.com and stay tuned for a full review here. As the sole owner and writer of this blog, I find I get behind writing about the products that I purchase or receive for review. So I thought I’d at least start posting a short blurb when I get a “new arrival” here at HotSauceDaily.com. Mainly to get some pics up, a little promo, and some link love. Enjoy, and stay tuned for full reviews in the near future. Can’t wait to see how the habanero taste comes out! .-= A post from Chris’s blog …Minestrone di Cipolline =-. I’m looking forward to that bright red Jalapeno! Never been a fan of Habbys, and have only found a couple that I like… Crazy Jerry’s Orange Rush, and Benito’s Mango Habanero. Pretty bottles. I like the style and look of those sauces. They almost remind me juice for some reason.